Why didn’t I get into geocaching before? Oh, that’s right, I have never had a GPS unit until now. I used to think geocaching was supposed to be played without a GPS receiver, but if you were lazy you used one. Now I know that some of these would be impossible to find without a GPS unit. This one is at a boardwalk near our house. My son and I went in search of it. I was familiar with the boardwalk and knew about where the cache would be located. I decided to park a good ways away from the cache instead of the parking lot that is just a couple hundred feet from the hiding spot. Along the boardwalk we looked for snakes and turtles. Though it was warm today, it has been pretty cool. The animals were not out playing in the water. This cache was easy to see once you looked at it. We were looking around thinking it would be very hidden. It is right in the open. We signed the log, which was just one of the 2 scraps of paper in the cache, and replaced it. Did not have anything to leave. This one was easier to access, but harder to find. The cache was sitting near its intended location. But the place where it was supposed to be would have been very hard to see. We ended up putting it back where the original hider intended. But, I think it will be kind of hard for the next hunter. This one contained a good variety of stuff. Wildflower seeds, NASCAR trading card, Mardi Gras beads, toy animals, etc. We signed the log. Lots of people have found this one. We left a gold safety pin. After we got home I was looking for more caches and found one just 3 blocks from the house. I got the wife and daughter involved. We walked to the cache and actually had to hike through the woods to find it. Each one is different in its hiding place. This one was not so much hidden by a clever spot, but just by the fact that no one would normally be walking in that area. Trees were pretty thick. Contents were a few toys and a log book. Curiously, it also contained a NASCAR trading card. We signed the log and left a Mexican Peso. For all the playing we did today, groceries still needed to be bought. We took my wife to the store and then went in search of a cache just 2 miles away. It was located near a park. We had never been to that park and did not know that there were trails all around it. We felt a little odd walking around the edge of the parking lot with lots of people staring at us. When we found the entrance to the trails, we were able to get completely away from the crowd. The cache was hidden earlier this week. We were not the first to find, but we did get to see many of the original contents. There was a small Etch-A-Sketch and some kids glasses. It was all kid focused and contained just toys, a dollar and a log book. We were the second to sign the log and we took a rubber snake. We left a Mexican toy called a “tazo.” They were called “pogs” when I was in school and “milk bottle caps” when my dad was a kid. After replacing the cache and going to the park to play, I realized I did not write down in the log what we took. I went back and corrected that. I was also curious as to whether the dollar was registered with Where’s George (it is a site that will track bill circulation based on user input of serial numbers). It was registered as a geocaching bill, but had no log entries. I took the bill and logged it at Where’s George. I will take it to Tennessee with me next week and deposit it in a cache up there. 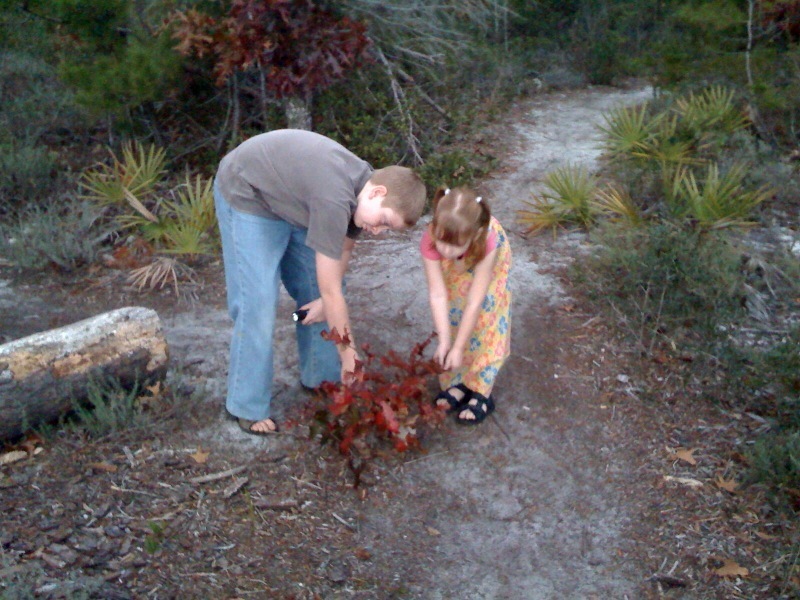 The kids love hunting for treasure.